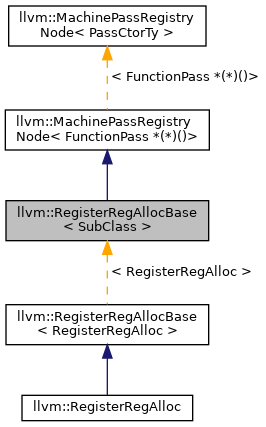 RegisterRegAllocBase class - Track the registration of register allocators. Definition at line 29 of file RegAllocRegistry.h. Definition at line 31 of file RegAllocRegistry.h. Definition at line 35 of file RegAllocRegistry.h. Definition at line 40 of file RegAllocRegistry.h. Definition at line 51 of file RegAllocRegistry.h. Definition at line 47 of file RegAllocRegistry.h. Definition at line 43 of file RegAllocRegistry.h. Definition at line 53 of file RegAllocRegistry.h. Definition at line 55 of file RegAllocRegistry.h. RegisterRegAlloc's global Registry tracks allocator registration. Definition at line 33 of file RegAllocRegistry.h.